As the casual sibling to Chicago’s justifiably lauded Girl & the Goat, the Little Goat Diner takes the idea of an all-day, all-night diner and schmancies it up just a touch. 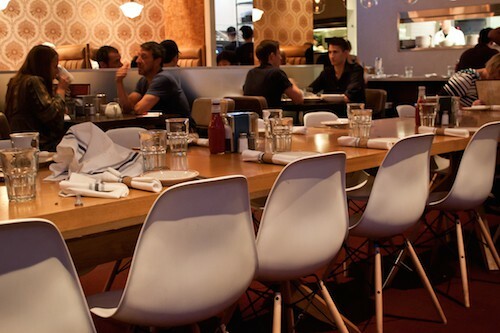 Yep, there’s a classic Formica countertop punctuated by spinning chrome-edged barstools, but you don’t always see a communal table with rows of pristine white Eames chairs at your local greasy spoon. Nor do you get to slide into cushy leather booths or sit under a mod raftered skylight hung with a Sputnik-worthy midcentury chandelier. In the same vein, the multi-part menu shows off a roster of deconstructed, reconstructed diner food. Disparate ingredients come together in “duh, of course!” combinations: kimchi and kraut paired up in a reuben, naan instead of pita on a Greek salad, BBQ maple syrup with de rigueur fried chicken and waffles. Lilies are gilded, but just barely. It’s comfort food that surprises but still satisfies. 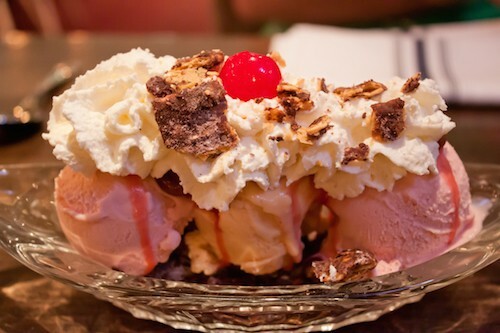 That’s a scoop of Cheez-It ice cream (yes, really) flanked by two scoops of strawberry Quik ice cream, topped with chocolate-peanut butter-coated Cheez-Its. Our server likened the taste of the crumbled Cheez-It topping to that of a Butterfinger candy bar, and it’s a spot-on comparison. The salty, rich notes balance the nostalgic artificial strawberry flavor in a sundae that really should be eaten during a Saturday morning cartoon viewing session. The menu remains the same from open till close, which means I can start my day with a whole mess of seafood and pasta just as nature intended. “Breakfast spaghetti ‘n clams ‘n crab” is a dream come true for this leftovers-for-breakfast lover: a frittata-ish round of savory spaghetti pie studded with wee shucked Manila clams and topped with sweet threads of crabmeat and handfuls of herbs. Not ready to be that adventurous at 8:00 am? Maybe you’d go for a more straightforward patty melt, perfectly greasy, tangy, and no less exciting for its lack of crazy ingredient insertions. 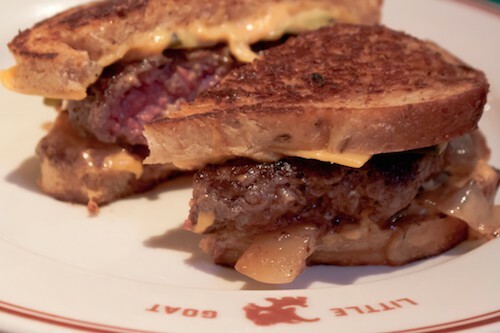 Well, you could eschew the traditional beef and choose a goat patty to nestle atop the thick caramelized onions and between the buttery slices of pretzel rye bread. If you’ve never tried goat, give it a go—after all, it’s the namesake protein here (and at Girl & the Goat, of course) and it’s a stellar introduction to this still-underrated meat. Or maybe you just want snacky stuff. 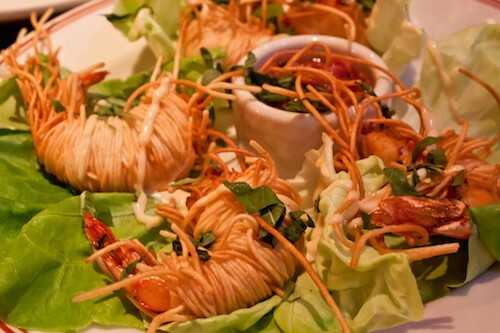 It’s not too hard to polish off all five jumbo shrimp in five minutes, each fat and tender specimen hidden within a deep-fried twirl of crispy somen tendrils. They’re so fun to eat on their own that the cocktail sauce is almost superfluous. 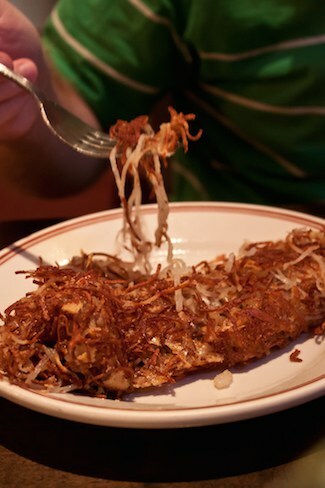 Or on the same crispy, loopy tip, to hoover down a plate of delicately shredded hash browns. Or maybe it should be hash brown, since it arrives as one cheese-bound tangle to be pulled apart with your fork (or fingers). 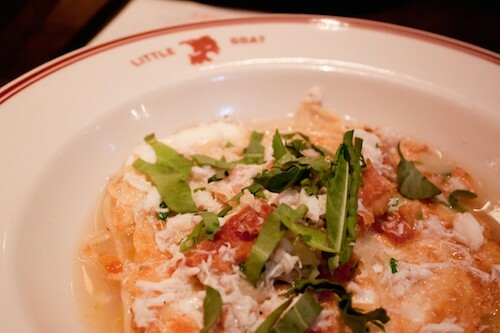 I don’t think chef Stephanie Izard is lobbying to take the Little Goat beyond Chicago borders any time soon. However, if she ever decides to go whole hog (whole goat?) with a Shake Shack-style expansion, I think she should meet New Jersey diners on their own turf and bring one out here to the Garden State so I can make it my regular neighborhood hang. Until then, I’ll keep logging miles to the West Loop in the hopes of eventually sampling everything on the Little Goat menu. I think I’m up for the task. Little Goat Diner, 820 W. Randolph St., Chicago. 312-888-3455.